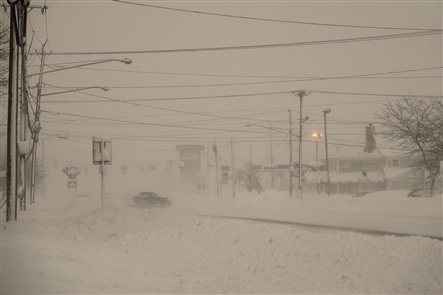 Shortly after the winter storm hammering Western New York was declared a blizzard, Erie County Executive Mark Poloncarz declared a state of emergency and announced that travel was being banned in several Southtowns communities. A travel ban has been declared in Hamburg and Orchard Park shortly before Poloncarz announced his decision on Twitter. The other towns affected are Alden, Aurora, Marilla, Elma, Eden, Brant, North Collins and Evans. It is the winter storm Western New York was promised as two separate bands of lake-effect snow pounded parts of the metro area, creating whiteout conditions in some areas and making a commute home to the Southtowns this afternoon a potentially perilous journey. Just after noon, the storm was officially declared a blizzard by the National Weather Service. Kirk Apffel, a meteorologist, said a blizzard warning was in effect for Erie, Genesee and Wyoming counties through 1 a.m. Thursday. What makes a blizzard a blizzard? * Snow or blowing snow. * Sustained winds of 35 mph for three hours. * It needs to be widespread. All of those criteria have been met, Apffel said. An advisory was also in place for Niagara County. A travel ban and state of emergency were issued for Hamburg and its two villages. Public officials and forecasters urged the public to stay off all roads if at all possible. An entrance ramp to the I-190 was closed after several motor vehicle accidents. The Erie County Sheriff’s Office reported multiple cars off roads in Elma and Brant. “Travel conditions are deteriorating to the point where people shouldn’t be driving,” the sheriff’s office tweeted. “I know Western New York knows about snow and can handle snow. But this is something different,” Gov. Andrew M. Cuomo said at a briefing in a Department of Transportation barn in Lancaster Wednesday morning. As noon approached, one snow band was parked over the Southtowns while another was hammering the City of Buffalo, making travel increasingly dangerous. Three head-on crashes were reported in Wales, Eden and Hamburg, Poloncarz tweeted at 11:15 a.m. But that’s only part of the story. The temperature dropped from the teens near dawn to zero by late morning. With the wind chill factored, it’s about minus 20. It only gets colder from here. The winds are also kicking up, with gusts over 30 mph. 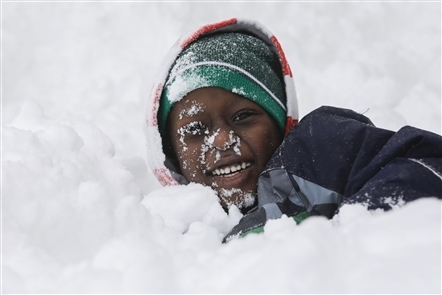 “This is the part of the event that we were concerned about,” said Dave Zaff, a meteorologist with the National Weather Service in Buffalo who, like his colleagues, has been carefully monitoring the winter storm that started bearing down on the region Tuesday morning. Gusty winds will accentuate the lake-effect snow falling now, but it will also be kicking up all of the snow that’s fallen so far. A lake-effect snow band that’s dropping snow at a rate of 1 to 2 inches per hour parked itself over the Southtowns and up to the edge of the City of Buffalo. Erie County public works officials were reporting visibility of less than 50 feet in Orchard Park midmorning. That band is expected to stay put in that area through the afternoon and into the early evening, said Kirk Apffel, a meteorologist with the National Weather Service office in Buffalo. Erie County Public Works officials reported heavy lake-effect snow in Orchard Park this morning with visibility less than 50 feet. Motorists reported that conditions on roadways in Hamburg were rapidly deteriorating. Snow was falling at a rate of one to two inches per hour this morning from the southern edge of Buffalo into the Southtowns, said Kirk Apffel, a meteorologist with the National Weather Service. * Tractor trailers and commercial buses will be banned from several state routes starting at 8 p.m. tonight because of the winter storm. * Every school district in Erie County has declared snow days on Wednesday AND Thursday. 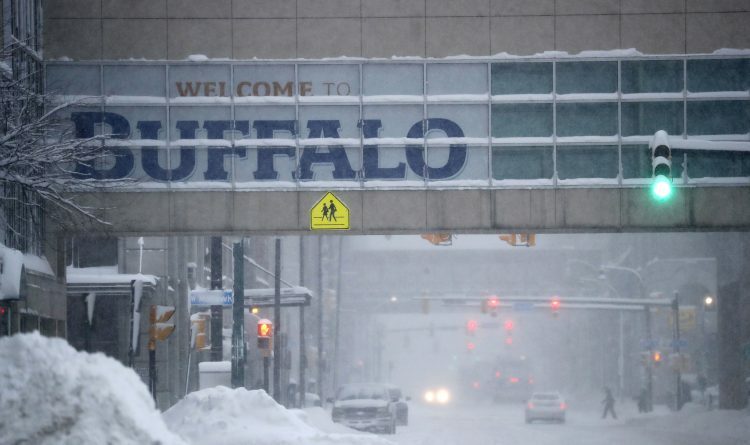 * Erie County Executive Mark Poloncarz issued a travel advisory for Buffalo and Northern Erie County and asked county clients to avoid coming downtown today. * Some flights were canceled out of Buffalo Niagara Airport. * Erie County Medical Center canceled all outpatient clinics except dialysis for Wednesday. * Ice breakers were out in the Upper Niagara River to prevent potential flooding. * And in a sign that things are really getting serious, Paula’s Donuts announced it was closing its stores at 5 p.m. and wouldn’t reopen until 6 a.m. Friday.